We know that Xiaomi is preparing to launch its next-gen smartphone, the Mi5, this month. We also heard talk about an Mi5 Plus model which should make it out alongside it. Today we get a new leak regarding the two flagships, which paints a slightly different story than what we have heard so far. The most important change is that, according to the leakster on Weibo, the Mi5 will take advantage of a Snapdragon 810 processor while the Mi5 Plus will be fueled by a next-gen Snapdragon 820. We previously heard that both models will be the recipients of a Snapdragon 820. Moving on, we’re told that the Xiaomi Mi5 will be the beneficiary of a 5.2-inch LCD display with Gorilla Glass 2.5 and taking advantage of 2560 x 1440 pixel resolution. The device has a 16MP primary camera alongside a very capable 13MP selfie shooter (at the level of the HTC Desire EYE). The phone is said to be sustained by a 3,000 mAh battery and will take advantage of quick charge support allowing users to juice up 30% of the battery in just 40 minutes. The phone is said to be running the yet-unannounced MIUI 7 interface which is based on Android 5.1 Lollipop. Xiaomi is yet to offer the latest Android update to its handsets. 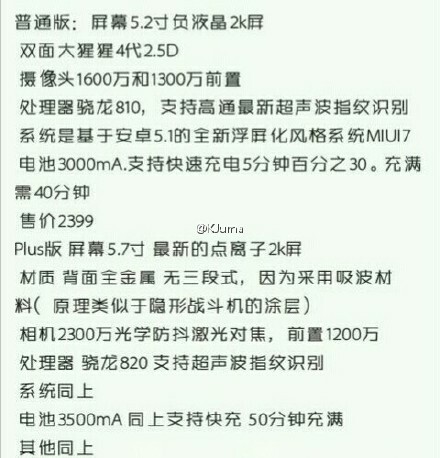 The leak document also shows us a price for the device which will be equivalent to $386 / €352. Moving along to the larger Mi5 Plus, the phone will come with a 5.7-inch display with QHD resolution and will take advantage of an impressive 23MP main shooter as well as a 12MP frontal camera. We can’t help but notice that these are pretty bizarre numbers, so we might be looking at a 24MP main snapper plus 13MP front camera. The Mi5 Plus is showed as having a 3,500 mAh battery on the inside and a pretty chunky $600 / €547 price tag attached.